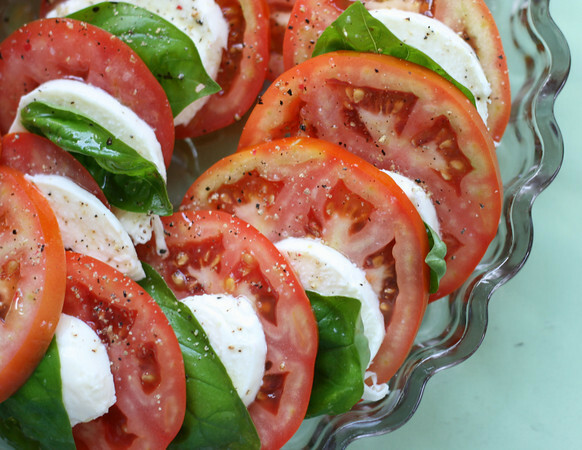 My favorite warm weather salad is the classic Caprese. Vine ripened tomatoes, Buffalo mozzarella, basil and EVOO. Instead of the usual "stack it up and tear it down" variety ..
... I like to do a "put it all in a bowl" variety. I dice up the tomatoes and mozzarella, roll up the basil and cut in "chiffonade" - long thin strips. I added some fresh oregano from the backyard planters where the basil came from, some roasted garlic grey salt I buy from NapaStyle.com, throw in some EVOO and black pepper... delicious. Where did you get good tomatoes now? We get really good produce Barbara. A lot of it comes from Mexico and South America, but a great deal, especially at the smaller markets are locally grown. I grow our own basil, chives, oregano, rosemary, jalapenos, chili piquins and we have two varieties of tomato plants working!